The Korean Cultural Center, in cooperation with The Podium, will be launching the Hanji Doll Craft Exhibit on January 9 as part of its efforts to promote Korean culture to the Filipinos. 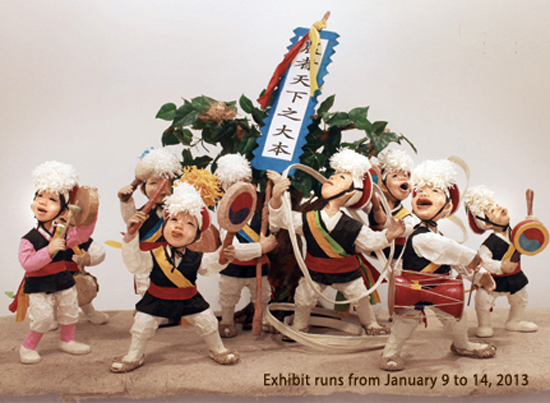 The Hanji Doll Craft Exhibit will be highlighting Korea’s traditional art form derived from the use of the Korean traditional paper or Hanji. The Hanji craft has long been a creative tradition in the Korean folk culture. The Hanji, on the other hand, is Korea’s durable paper made from the bark of the mulberry tree and is said to last a thousand years. The exhibit will feature the works of artist Jae Hee SEO as well as those of her students from the Korean Cultural Center. The exhibit will run until January 14 at the Atrium. The Hanji doll craft is an art made with Korean traditional materials, and is largely similar with the western papier-mâché as it also uses paper and paste to create a three-dimensional object.